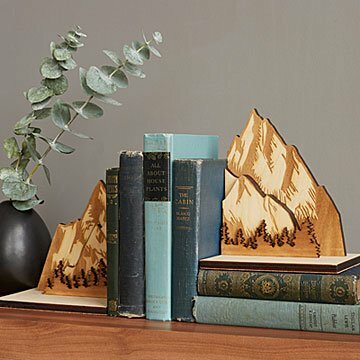 Nestle your favorite stories in a handmade mountain range with Stephen Truong's beautiful bookends. You're snuggled up by the fire, hot tea in one hand and a good book in the other. Your view? A breathtaking expanse of mountains. These handmade bookends let you recreate a bit of that magic, even if you're miles from the nearest ski lodge. To craft each pair, Steven Truong mimics the dimensions of an actual range, carefully laser cutting each peak, ridge, and nearby pine from baltic birch plywood. A delightful gift for book and nature lovers alike, it gives any shelf a touch of mountain charm. Handmade in Texas.